Yes, I received one, a beautiful, healthy granddaughter. So I have nothing Hellboy to report but I thought you should have your own delightful bundle. So here's extra info on the Best Buy deal. 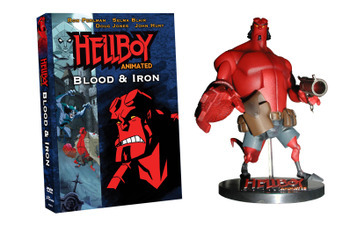 Best Buy EXCLUSIVE: Hellboy Animated: Blood & Iron DVD & Cigar Smoking Hellboy action figure available in extremely limited quantity on June 12th. Only 10,000 gift sets exist with this exclusive figure that cannot be purchased anywhere else individually or packaged together with the DVD. Act Fast – this will go quickly. The Action Figure has a retail value alone of $16.98 and the DVD has a retail value of $19.98, but the set is being sold for a suggested retail of only $24.98. Figure stands at over 6.5 inches. Congratulations with your newborn granddaughter, Tad! That's great, Tad. A new grandchild to cherish. Congrats! I know she will be schooled in the finer animation DVDs. The figure (smoking or not) looks great. I will have to be at BB at opening in hopes to score one...or two! Congratulations my friend! !I wish you and your family all the best. Sincerest congratulations, my friend!!! Being a grandparent means you can always give 'em back at the end of the day! Enjoy her, dear heart, and I know you'll have her well-trained in the art of animation before she can walk. Oh, and my DVD is already on order! Congrats to the mom and dad of your granddaughter. Hope all is well and everyone of you is healthy and happy. How come HMV has the same exact exclusive? HMV? Dunno. Maybe they're in different areas or have the same parent company. Best Buy has the cigar head, maybe HMV has the normal head. I accept it as good news that the figure will be more widely available to fans. "Extremely limited" indeed; I apparently picked up the only one the Cambridgeside Galleria mall Best Buy had here near MIT, where I'm guessing there are a few Hellboy fans still hanging around campus. The cigar head is pretty slick! Like Geoffrey Long above, I seem to have scored the only one at the Best Buy in State College, PA. Looks pretty awesome! And I got it for just $17.99. I bought one of the two action figure bundles that were on the shelf in Sacramento, CA. I was in the store before 10:15 this morning too. Hope everyone that wanted one got one. I had no idea it was going to be so detailed , I figured it was going to be a cheesy rubber/plastic statue. This was an amazing deal, and a cool get for Hellboy fans. Hope you guys get to make the third movie, and a fourth, fifth and sixth. Thanks again.